This discussion is not meant to diagnose, treat, or recommend treatment for any type of disease or ailment. Please consult a medical professional with any questions you may have. What are they - So what exactly is a tick? An annoyance, that's what. A tick is a small blood-sucking parasite that attaches itself to a host in order to feed. Ticks are actually second in ranking to the mosquito in spreading disease among humans. There are many species of ticks, but here in New England there are two prevelant species. 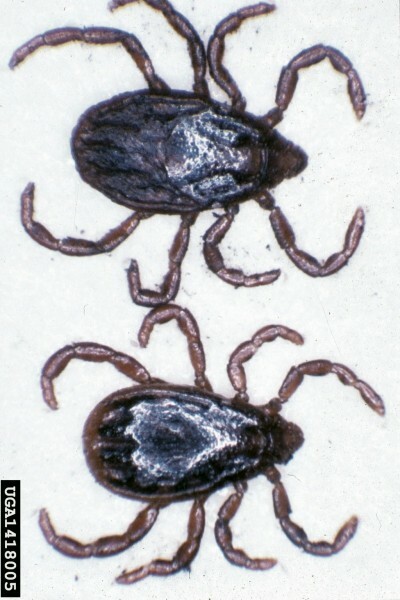 The American Dog tick (Dermacentor variabilis) and the Black Legged tick (Ixodes scapularis). The Black Legged tick also is called the Deer Tick. Ticks can not jump from ground to host, they actually can't jump at all. They actually wait on tree branches, grass, bushes...other things that one might be bushwacking through whilst hiking. But you can also get ticks on you if you go running around your freshly mowed back yard, so be sure to always check yourself, your pets, and your children. This includes your scalp, btw. Disease - The american dog tick actually cannot carry Lyme disease.It can, however, carry Rocky Mountain Spotted fever, which is NOT exclusive to the Rocky Mountains. Actually there have been cases of the disease reported in all states except Hawaii, Alaska, Vermont, and Maine. (CDC) North Carolina and Oklahoma have the highest infectious rate in the US. The classic triad of findings for this disease are fever, rash, and history of tick bite. However, this combination is often not identified when the patient initially presents for care.The rash first appears 2-5 days after the onset of fever and is often not present or may be very subtle when the patient is initially seen by a physician. Younger patients usually develop the rash earlier than older patients. Most often it begins as small, flat, pink, non-itchy spots (macules) on the wrists, forearms, and ankles. These spots turn pale when pressure is applied and eventually become raised on the skin. The characteristic red, spotted (petechial) rash of Rocky Mountain spotted fever is usually not seen until the sixth day or later after onset of symptoms, and this type of rash occurs in only 35% to 60% of patients with Rocky Mountain spotted fever. The rash involves the palms or soles in as many as 50% to 80% of patients; however, this distribution may not occur until later in the course of the disease. As many as 10% to 15% of patients may never develop a rash. Rocky Mountain spotted fever can be a very severe illness and patients often require hospitalization. Because R. rickettsii infects the cells lining blood vessels throughout the body, severe manifestations of this disease may involve the respiratory system, central nervous system, gastrointestinal system, or renal system. Long-term health problems following acute Rocky Mountain spotted fever infection include partial paralysis of the lower extremities, gangrene requiring amputation of fingers, toes, or arms or legs, hearing loss, loss of bowel or bladder control, movement disorders, and language disorders. These complications are most frequent in persons recovering from severe, life-threatening disease, often following lengthy hospitalizations. Sounds real fun, doesn't it? * Cardiac. 10% of patients may have cardiac manifestations including heart block and palpitations. Remember, deer ticks are the ones that carry Lyme disease. Dog ticks do NOT carry Lyme disease, but they may carry Rocky Mountain Spotted Fever. Dog ticks have a strong desire to crawl "upward" from the point of initial contact. The best prevention would be just to not bushwack or hang out in tick territory. So...if you are the outdoorsy type this really isn't an option. So, for starters try tucking your pants into your socks. This helps prevent ticks from crawling up your legs. Eww. Also, wear light colored clothing so you can see a tick crawling on you. When disrobing at home, if you can do so on a porch or other area, ball up your clothes and promptly stick them in your washing machine and let them soak for a bit before washing. If you do not have a porch area, be careful...you don't want a tick to drop onto the floor and crawl up on kitty the next time he walks by! DEET: The primary active ingredient in most insect/tick repellents today is DEET (N,N-diethyl-3-methylbenzamide or N,N-diethyl-m-toluamide). DEET is the most effective, broad-spectrum repellent ever discovered. The U.S. Environmental Protection Agency (EPA) estimates that over one-third of the U.S. population will use a DEET-based product. There are approximately 230 products containing DEET registered with the EPA (e.g. Cutter, Off, Repel, Muskol, Ben's, Sawyer, and others). Products range in concentration from 4% to 100% DEET and are available as an aerosol can, pump spray bottle, stick, lotion, cream, or towelette for application to skin or clothing. DEET is only effective for one to several hours and must be reapplied periodically. The effectiveness of DEET on the skin is influenced by the concentration of DEET, absorption through the skin, evaporation, sweating, air temperature, wind, and abrasion of the treated surface by rubbing or washing. Higher concentrations generally provide longer protection, but increasing the concentration does not provide a proportional increase in protection time. Recently, several controlled-release DEET formulations have been developed which decrease skin absorption and increase protection time. Extended duration products include HourGuard, Skedaddle, and Sawyer's Controlled Release. All active ingredients and their concentrations are listed on the product label. DEET and ticks: DEET will repel ticks and decrease the chances of tick bite, but depending upon the concentration, it may not provide total protection against I. scapularis. Little is known about the effectiveness of different concentrations of DEET against I. scapularis. Concentrations of DEET that might prevent tick attachment may not deter a tick from walking across the skin to unexposed and untreated areas. When applied to clothes, 30% and 20% DEET was found to be 92% and 86% effective against I. scapularis (deer ticks), respectively, but skin applications were reported to be only 75 to 87% effective against crawling ticks in a second study. For blacklegged (deer) ticks, DEET concentrations around 30 to 40% probably should be used, although the effectiveness of higher (>50%) and lower (<20%) concentrations against I. scapularis needs to be examined more closely. When applying a repellent against ticks, particular attention should be given to the shoe tops, socks, and lower portion of pants. Permethrin: Several products contain 0.5% permethrin (e.g. Duranon Tick Repellent, Repel Permanone, Cutter Outdoorsman Gear Guard, Permethrin Tick Repellent), which is for use only on clothing or other fabrics such as mosquito netting or tents. A synthetic pyrethroid insecticide rather than a true repellent, permethrin works primarily by killing ticks on contact with the clothes and can provide high levels of protection against tick bites (and mosquitoes). Permethrin is available as a 0.5% aerosol spray, mainly in lawn and garden centers or sports stores. Permethrin has low mammalian toxicity, is poorly absorbed through the skin and is rapidly inactivated by the body. Skin reactions have been uncommon.